Ellen Forney poetically describes the manic episodes of her bipolar disorder as electrifying: “the sensation that my mind was spinning and overheating would sometimes build to a sensation like an electrical short—a burst of light, a melting or dissipating—.” Reading Forney’s graphic memoir, Marbles: Mania, Depression, Michelangelo, and Me, produces a similarly charged encounter. The reader experiences not only Ellen’s exhilarating highs—the extravagant book launch parties, the professional success—but also her devastatingly dark lows—the blank periods of time where she is unable to move herself from the couch. Marbles captures Forney’s struggle toward psychological rapprochement in beautifully-drawn, boldly-rendered prose and images. Taking full advantage of the comic form, Forney’s drawn representation of herself changes to reflect whether Ellen is in a manic state—marked by exaggerated features and dilated pupils—or depressive—reduced to a featureless lump, cocooned under a blanket. While Marbles’s frame narrative is told in retrospect, the text also acts as an archive, weaving in Forney’s actual illustrations, journal entries, and published work from 1998-2002. Drawing is cathartic for Ellen, who describes it as “some mental image I need to get outside of me.” The haunting, visceral agony contained in the scratchy lines of her old sketchbook are particularly poignant and affecting, especially one image of a contorted, grotesque human body, eyes squinted shut in pain, tucked inside a thorny bird’s nest. 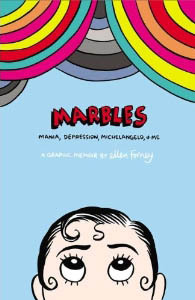 Forney is a professional comics artist (among her many accomplishments, she is the illustrator of National Book Award-winning The Absolutely True Diary of a Part-Time Indian), so it is not surprising that a central concern of Marbles is the relationship between mental illness and creativity. At first, Forney embraces the “crazy artist” archetype, excitedly poring over a list of famous probable manic-depressive or depressive artists, including Vincent Van Gogh, Sylvia Plath, and Georgia O’Keeffe. But lived experience is less than glamorous, as Ellen realizes when she discovers that one of her sketchbook self-portraits is a unconscious redrawing of a hell-bound figure from Michelangelo’s the Last Judgment. Gradually, Ellen comes to conclude that mental stability fuels, not hinders, her creativity. Beyond meditating on the relationship between mood disorders and art, Forney painstakingly documents the day-to-day messiness not captured under the DSM-IV’s neat diagnosis of “Bipolar I Disorder 296.4.” She offers varied approaches for coping; some are traditional, like cognitive behavioral therapy and advice on how to swallow all of one’s pills in one gulp, while others are more creative and idiosyncratic, like finding solace in children’s books or applying M.A.C. Paramount lipstick to project confidence. Much of Marbles addresses the long journey of trial-and-error necessary to find the right balance of medications, where “keeping track” and “watching” are complicated by the lack of a fundamental baseline to measure against. Over the four-year period covered in Marbles, Ellen cycles through multiple psychotropic medications, each with its own suite of side effects. Marbles closes with a moving dialogue between current-day Ellen and her younger self. Perched on chairs face-to-face, a visual pun of Ellen’s many conversations with her psychiatrist, older Ellen reassures her younger self that she can handle the challenges ahead. “What is your life like?” her younger self asks. “It’s different, but it’s not really that different,” older Ellen replies. I’m still you.” For those who deal with mood disorders as well as those seeking to understand them, Marbles offers an entertaining and moving story that provides a much-needed corrective to a normative view that considers mood disorders categorically damaging. As Ellen suggests: “accepting challenges is sometimes referred to as ‘surrender’—not meaning defeat, but acceptance, recognition, release.” In Marbles, there is no transcendent life after bipolar disorder, only a full life with it. Ellen will be a keynote speaker at our 5th Annual Comics & Medicine Conference, June, 2014 in Baltimore, MD. Details here! A Seattle Times interview with Forney can be found here. This is really the second article, of your website I personally went through.